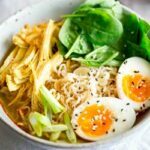 If you are searching for what to do with thanksgiving leftovers then search no further, this turkey ramen is the ultimate leftover turkey soup! 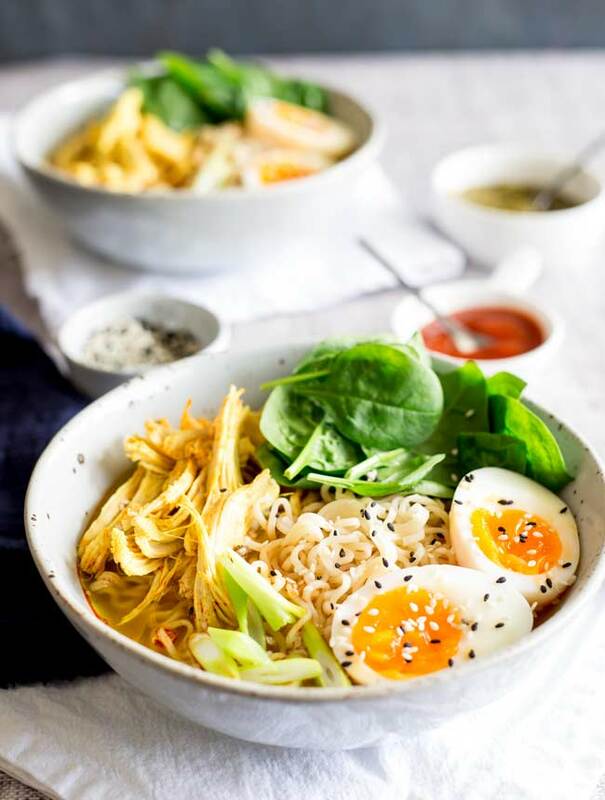 The turkey is poached in a delicious and easy stock, which with a few additions turns into the wonderful broth for this simple homemade ramen. You can up the chili and make it spicy and even use two minute instant noodles. 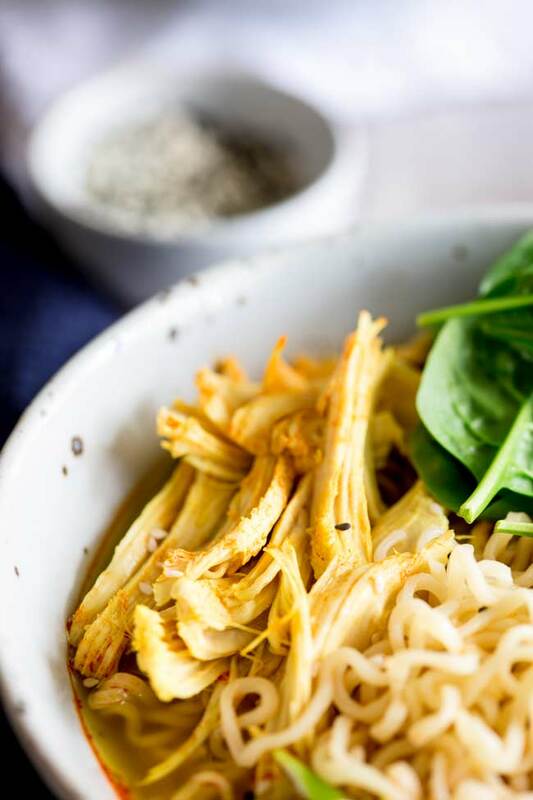 A great alternative to chicken ramen and just perfect for holiday leftovers. I just love ramen. Starting way back in university when I would slurp down bowls of the 2 minute noodles and gradually educating myself on the way of the ramen as I learnt about the wonders of this noodle dish sat at the noodle counter of our local Japanese restaurant and ordering big bowls of ramen with an oversized wooden spoon and chopsticks. The toppings were amazing, the noodles fresh and homemade and the broth!!! Oh that delicious broth. 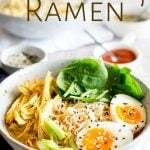 Making ramen at home isn’t as quick as the instant noodles, but it is a whole lot tastier. And you can still have dinner on the table in under half an hour. 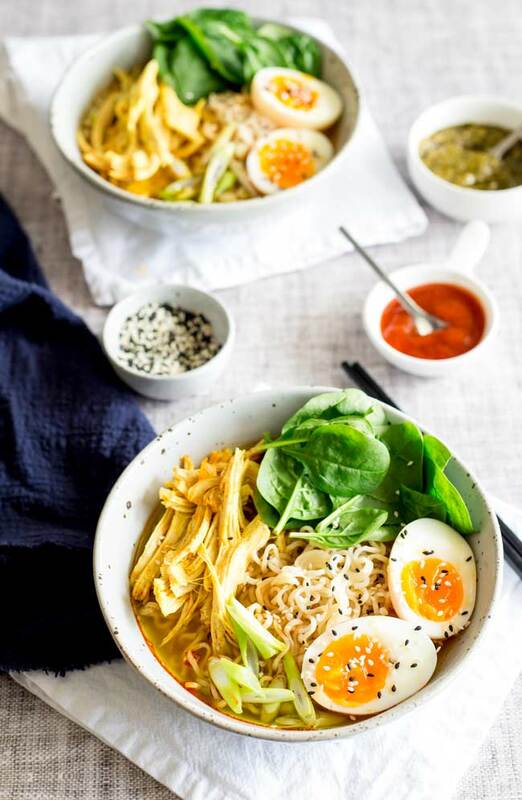 (p.s this isn’t authentic ramen, but this is ‘easy to buy in the supermarket ingredients, dinner on the table quickly whilst still tasting authentic’ ramen. Add a soft boiled egg (optional but good!). Far and away the most important part of this process is the broth. If your broth is below par then the whole bowl of ramen will be less. 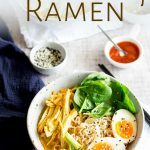 To make the ramen broth you get in restaurants takes a good 24 hours, but I have a few hacks that will save A LOT of time and help boost that flavor. How to make a great ramen broth at home. Firstly you want to start with a great starting stock. Something with plenty of savory flavors. A good store bought chicken stock/broth is a great place to start. Or if you have your own in the freezer now is definitely the time to use it. Make sure you buy the low sodium stock/broth, we want to add plenty of other things and don’t want salt to be the over riding flavor. You start the recipe by frying off garlic and ginger then adding the stock/broth. This is the basis of your ramen broth. If you have any bones left from your thanksgiving turkey, throw them in at this point and bring it to the lowest of simmers. Cook for 15 minutes whilst everything else is being prepped. This is now the base for your your ramen bowl. Once you have the base, you are going to add, soy sauce, oyster sauce and a little rice vinegar. All big flavor ingredients that will boost the flavor of your ramen broth. I avoid adding too much spice so I can make this a family meal, instead opting to serve it in condiment bowls for people to add as they like. The broth will need tasting and thinning down with some hot water. I find I usually need to add a 1/4 cup of water. It depends on the saltiness of your starting stock and how low your initial simmer was. Taste the broth, it should be really packed with flavor, not too salty and with a mild tang at the end. If you are using leftover turkey or chicken then it is nice to lightly poach it in the broth, this heats it up, takes on some of the flavor and also doesn’t dry out. 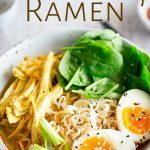 What are the best noodles for ramen? You can buy ramen noodles dried or fresh. Both will work in this recipe and I have even used 2 minute noodles (without the flavour packet!) and they taste great too. 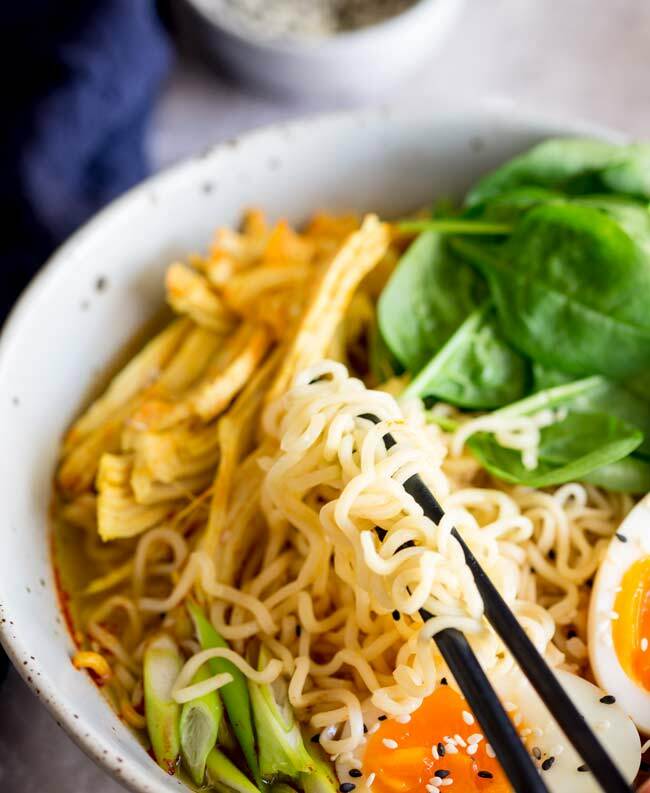 Dried ramen noodles are the easiest to find, the most common being the tangled bricks of noodles and they are great for when you want dinner quickly. If you have time to plan ahead then you can buy some great authentic dried noodles online. Our local grocery store stocks Hime noodles and they are my favourite dried kind. But if you can find fresh ramen noodles then you are in for a treat, they are delicious, with just the right amount of chew. You can usually find them in Asian supermarket in the refrigerator section or in the freezer section. If you still have turkey left why not try my leftover turkey waffles with bacon and maple syrup. Why not pin this recipe for Leftover Turkey Ramen. Pin it here. Peel the ginger and the garlic and then finely grate them into a cold large saucepan. Add in the chilli oil and cook over a low heat so they start to soften. Pour in the chicken broth, then bring to a boil, then reduce the heat so the broth is simmering, add in the shredded turkey and set over a very heat. And simmer for 15 minutes. Meanwhile, bring a second pan of water to a boil then add in the eggs and cook for 7 minutes. Immediately use tongs to remove them from the water and drop them into a bowl of ice water. You want to lightly crack the shells as they go into the iced water. This makes them so much easier to peel! Once cool enough to handle, peel gently, cut in half and set to one side. Once the noodles are cooked drain well. Whilst the noodles are cooking add the soy sauce, oyster sauce, rice vinegar and pepper to your broth. 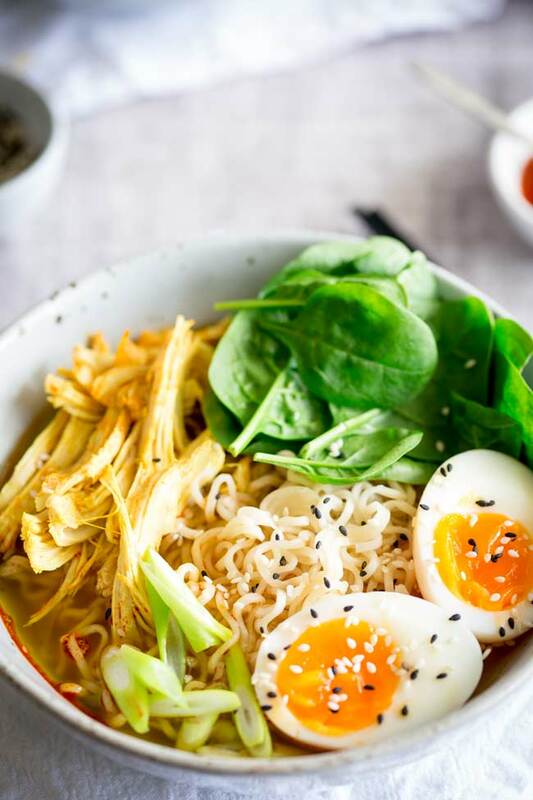 Divide the noodles between four deep bowls, arrange, ladle over the broth arranging some turkey on the top of each bowl, add in a handful of spinach, the cooked eggs and a garnish of chopped green onion and sesame seeds. 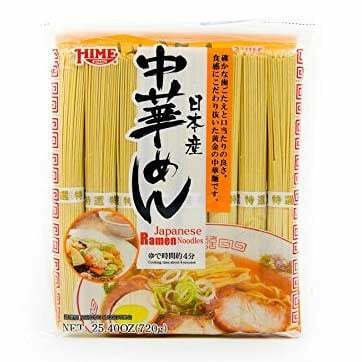 Dried ramen noodles are the easiest to find, the most common being the tangled bricks of noodles and they are great for when you want dinner. If you have time to plan ahead then you can buy some great authentic dried noodles online.